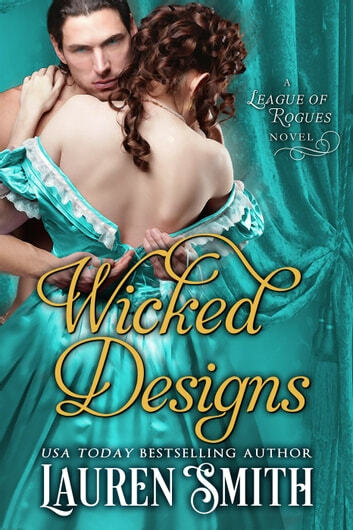 Fans of Julia Quinn's Bridgerton Series and Johanna Lindsey's Malory Series will love the passionate romances and gripping adventures of the League of Rogues. For too long Miss Emily Parr has been subject to the whims of her indebted uncle and the lecherous advances of his repulsive business partner. Her plan to be done with dominating men forever is simple—find herself a kind husband who will leave her to her books. It seems an easy enough plan, until she is unexpectedly abducted by an incorrigible duke who hides a wounded spirit behind flashing green eyes. Godric St. Laurent, Duke of Essex, spends countless nights at the club with his four best friends, and relishes the rakish reputation society has branded him with. He has no plans to marry anytime soon—if ever. But when he kidnaps an embezzler's niece, the difficult debutante's blend of sweetness and sharp tongue make him desperate for the one thing he swears he never wanted: love. Yet as they surrender to passion, danger lurks in Godric's shadowed past, waiting for him to drop his guard—and rob him of the woman he can't live without. Warning: This novel includes a lady who refuses to stay kidnapped, a devilish duke with a dark past, and an assortment of charming rogues who have no idea what they've gotten themselves into. *Includes Exclusive Illustrated Scenes throughout the book! I am all for a little kidnapping plot, but this borders on gross creepy feelings inside. I can usually finish ANY book depending on how desperate I am, but I cannot do this one. The continuous laudanum despite being able to lock her in a room. The creepy friends eying her with lust. Feeling her up when she's unconscious. I feel like every page I turned was about to lead to something that would require the death penalty in most countries. What a captivating book. This is my first time reading a book by Lauren. I thoroughly enjoyed it what a page turner. The five men are endearing and the romance is exciting it's development. This is a well-written book and I can't wait to read Lucien's and Ashton's stories. So glad I started with the first segment. It introduces all 5 rogues. I loved them all and can't wait to read all their adventures into romance. The storyline was captivating from the first pages and the further you read the more intriguing it gets. Great read.